Gary, a 43-year-old, works aboard a tugboat and is often out for four days straight with his crew before coming to shore. While at work, he bumped his shin on a piece of rigging, which led to an abrasion with a sizable bruise coming up the next morning. Having had lots of bumps and scrapes at work, Gary thought nothing of it, and chose to “tough it out”. When his wife, Sharon, picked him up from the port two days later, he wasn’t feeling well. He had a low-grade fever, felt achy all over, and the pain in his leg was getting worse. He just wanted to go home, have a shower and go to bed. Sharon looked at his shin and noticed that it was swollen, red, really hot to touch and very painful with any pressure being applied. When such injuries occur, one should consider the possibility of the potential for infection. Gary could consider calling 811 (the Nurse Advice Line), going to an Urgent Care Clinic or the closest Emergency Department. Once a full assessment has been completed, Gary may be referred to an Infectious Disease Specialist, Occupational Health Specialist or Vaccination Services. A First Aid Supply Store, Medical Supply Store and/or pharmacy may carry many of the products he could use to manage the injury. An emergency physician works in the the emergency department of a hospital and treats patients who are acutely ill. 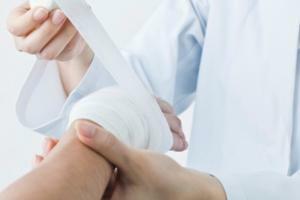 Emergency physicians can assess and treat a variety of injuries and issues, including wound care and management. Cosmetic surgeons are physicians who have additional training in reconstructive and cosmetic surgery. Cosmetic surgery may be requested or necessary in dealing with scarring left from an infected wound. A physiotherapist is trained and certified to work with patients to treat injuries and dysfunctions. They can work with you on range of motion and pain management, and can help with pain resulting from infected wounds. Conversation based on: Infected Wound Management " Gary a 43-year-old tugboat operator "
Reply to: Infected Wound Management " Gary a 43-year-old tugboat operator "
Good point, @K.Michael. As soon as the skin is broken in any way, you've got a chance of infection. I definitely like to have Polysporine in the cabinet and a variety of different size bandages and gauze. If you buy guaze, make sure that you get the non-stick type. I've made that mistake before on my kids wounds and when the gauze sticks to the wound you are in really big trouble. They won't let you pull it off (can you blame them?) and then it really does get infected. Good to know, I have had gauze stick to wounds before, didn't know there was a non-stick kind. Some grazes are so big and fragile-looking that I don't feel right not covering them at all to keep them from getting infected. If a wound becomes infected and scars, is there a way to lighten the scar naturally ? I've heard a number of people have success using vitamin E oil on scars. Taking a picture of the infected wound can be helpful for keeping track of whether it is getting better or worse. What over the counter products should a person keep in her medicine cabinet for wound care? My daughter developed an infection on a wound on her face. Unfortunately she kept picking at it and developed impetigo. I try to keep her nails very short because the dirt from them can get into seemingly minor cuts and cause an infection. It's very difficult to keep children's wounds clean and to keep them from touching them! If a wound is deep, how do you know you require stitches ? Can this cause scarring - would a plastic surgeon need to be seen ? I would expect a wound that doesn't close on its own will require stitching. Other things to try to limit scarring is to keep the wound clean as infection can cause worse scarring and also to limit sun exposure as that will darken the healing skin. People who have medical conditions (ie. diabetes) should take cuts very seriously. Their healing time can be much longer, as a result of the medical condition. This can lead to infection if not properly cared for. It's good to know what the signs of infection are if you have never had a serious infection before. Knowing this information could prevent delay in treatment when needed. Being informed is the key to a quick detection. Seeking medical attention when an infection is found is also very important. People tend to wait to long thinking it is not severe and will heal on its own. My son had quite a nasty scrape on his knee and without proper knowledge I put a regular gauze pad on top of it. The gauze pad stuck to the scrape, got infected and was just a mess. My advice, now that I know better, is to make sure you have non-stick gauze pads at home, which you can buy at any pharmacy - especially if you have kids. After cleaning the wound these won't stick and create further problems. My child had a bike accident last year and got a minor but large scrape. We lightly covered it as the scab was forming to keep it from getting dirty. I asked the local pharmacist what the best care would be, and I believe she said keeping it dry, to from it's own scab, is preferrable. I have always believed that the best cover for a scrape is it's own crust. If I can avoid covering scrapes for my kids I do. They scab over and create their own protection from infection. I feel for you - I have also had to pull off gauze from a bad scrape. It's not fun. This is a good case study to remind us that tetanus vaccination requires a booster every 10 years. I find it confusing sometimes to know when a wound should be kept covered up and when it should be left uncovered to help with the healing process. As a general rule of thumb when it comes to my kids, I try to keep the wound covered when they are at school/running around all day, and try to let wounds air out overnight. Does anyone know if this is a good approach? I think it's something we should try to remember or if we stayed with the same doctor, they can find out for us. I had a car accident when I received a tetanus booster for my cuts. I don't think I had a booster in years. I just had the Tetanus booster recently, but need to see if my 11yr is coming due for it. Is this something our GP should be keeping up on? Or do you wait until you have a need (a cut, or bite)? Is there any information on this? 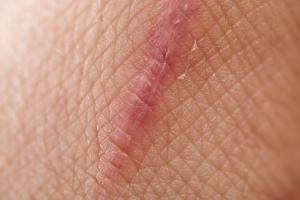 Caring properly for a wound can also minimize scarring. Never heard that about sun exposure and scarring! Interesting! I read that covering the wound from sun exposure also helps with reducing skin darkening around the wound area. Also, how large was the wound? Some people do not seek medical attention as they think it will go away on its own. Seeing a doctor can help the infection and time of healing. Why is regular soap better than anti bacterial soap to clean a wound? Did you speak with a physician or other health professional about antibacterial soaps and wound healing? That's very interesting and something that should be discussed as antibacterial soaps are so readily used. Regular soap and water is better than antibacterial soap for cleaning wounds. Any wound that is not healing well should be attended to immediately. An infected wound can have serious consequences. Yes, also especially important if a person has another underlying condition such as diabetes which can hinder proper healing.